A record shop or record store is a retail outlet that sells recorded music. Vinyl records have only recently returned in a big way to record shops. Despite this, people in English-speaking countries have always used the term "record shop" to describe a shop selling physical items containing recorded music such as CDs, tapes and records. Originally record shops were privately run and independent businesses, meaning that prices could differ greatly from town to town, store to store. Today recordshops are largely chain owned and thus prices are fairly similar regardless of the wealth of the town. In the United Kingdom the national chain style of selling records and tapes took off with Our Price, itself originally a small independent business founded in the early 1970s that expanded nationwide. 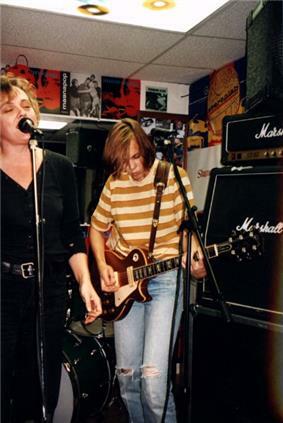 Current major chains around the world include HMV, Fopp, Rough Trade, Free Record Shop, Virgin Megastores, Tower Records, FYE, Sam Goody, Newbury Comics, Amoeba Music and Rasputin Music. Traditional record stores (chain or independent) are still suffering from mail order and Internet selling, as well as supermarkets and box stores selling recorded music at prices way below the recommended dealer price as a loss leader, thus devaluing the product to a damaging degree. In more recent times digital downloads and streaming have helped to reduce physical sales. The large increase in sales of vinyl records in recent times has, however, provided an opportunity for growth in some sectors. The flagship HMV store at 363 Oxford Street, London, for example, has opened and now greatly enlarged a whole department for new vinyl LPs and singles. Despite the recent reemergence of some major chains around the world, the above factors have caused all major chains in the UK and North America to close or downsize in recent years. Our Price, Zavvi, The Wherehouse, Andys Records, Music and Video Club and Media Play have ceased trading. Virgin has closed all stores in America and Europe. Tower Records has closed all stores in North America. Rough Trade is, however, currently expanding, with two shops in London, one in Cambridge, one Megastore in New York and plan to further expand. The only record shop chains in Europe are now HMV (UK, Ireland), Tower Records (Ireland), Free Record shop (Luxembourg: complete stores, Netherlands: shop-in shop) and Golden Discs (Ireland). Record shop chains still present in North America include HMV (Canada), FYE, Sam Goody and Rough Trade (both USA). 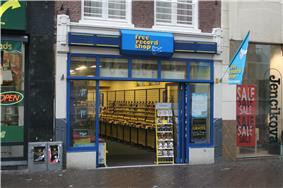 Outside of Europe and North America, the current record store chains include Virgin Megastores, HMV and Tower Records. HMV in Oxford Street, London, England claims to be the world's largest record shop. The store was originally opened in 1921 by the composer Sir Edward Elgar and has four floors of CDs, LPs, singles and DVDs. The revamped store was reopened in 2013 attended by many of the world's biggest stars including Paul McCartney, Robbie Williams and Elton John. The largest record shop in Ireland is Tower Records in Dublin, the largest in Asia is Tower Records, Shibuya Tokio, and the largest in the USA is Amoeba Records in Los Angeles. The largest record shop in the Nordic countries is Bengans in Goteborg, Sweden, which opened in 1974. In some countries, electrical store and department store chains have very large, comprehensive record departments all of which now have a large selection of vinyl records. These include Saturn, Media Markt and FNAC (Europe), Dixons / Vroom & Dreesman (Netherlands), and Corte Inglés (Spain). Media Markt in Cologne, Germany claims to now have the world's largest selection of records. In addition to shops that sell new product, many record shops specialize in second hand or used collectible records, which they purchase from the public or other dealers, and sell for a profit. It is not uncommon for such shops to contain several items priced in the hundreds or thousands of US dollars (or local equivalent) due to their rarity, as well as items that are fairly common for much less. This type of record shop has also faced fierce competition from Internet sites like eBay, where people can sell their own records and avoid "the middle man". Spillers Records in Cardiff, Wales, founded in 1894 by Henry Spiller, is reputed to be the oldest record shop in the world. It originally specialised in the sale of phonographs, cylinders and shellac discs. In 2006 it was reported that it could be forced to close by a sharp increase in the rent for its premises, but later moved to another location nearby. Rinehart's Music & Video in Kirksville, Missouri holds the title of Oldest Record Store in America. They have been in the business of selling music recordings since 1897, when Edwin S. Rinehart started selling wax cylinders and Edison Phonographs; it remains in the family to this date. Over the years, they expanded their inventory to include all music and movie formats. They recently have branched out into video games. Rinehart's is a prime example of the independent record store evolving with changing market trends to stay commercially viable. Independent record store numbers are dwindling with many major cities limited to just a handful of stores. For example, Plugd Records in Cork is the only independent store left in Ireland's second largest city. In the U.S. however, Specialty Record Store Business is booming with hundreds opening from 2013-2015. The County of Los Angeles currently has more Independent record stores than any other county in America with over 50 stores ranging from Amoeba Music in Hollywood (the World's Largest Independent Record Store) to The Record Parlour, the only Record Store where you can purchase, produce and perform music all under one roof.